Lindenwood quarterback Najee Jackson passes the ball in Saturday’s game against Washburn University at Hunter Stadium. 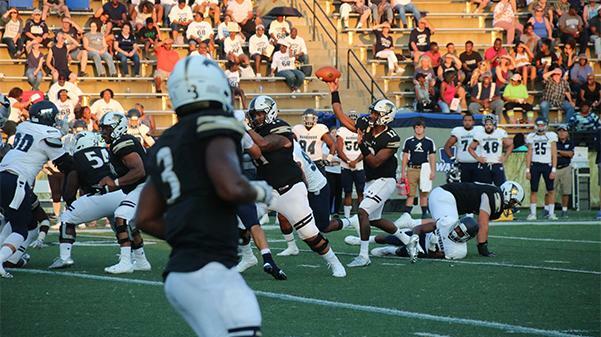 Jackson had 17 complete passes for 196 yards, but Lindenwood lost 26-16. Photo by Maria Escalona. A 13-0 halftime lead by Lindenwood Saturday night wasn’t enough to beat the Washburn Ichabods. Washburn scored 26 points in the second half, and went on to win 26-16, handing the Lions their second loss of the season. The game was played at Hunter Stadium as part of the Family Weekend activities. The Lions struck first with a one-yard touchdown rush by running back Calen Campbell at 14:58 of the second quarter. Lindenwood’s defense followed up by forcing a three-and-out. Lions receiver Kendall Sparks then returned the 54-yard Washburn punt for 16 yards to the Lindenwood 36 yard line. 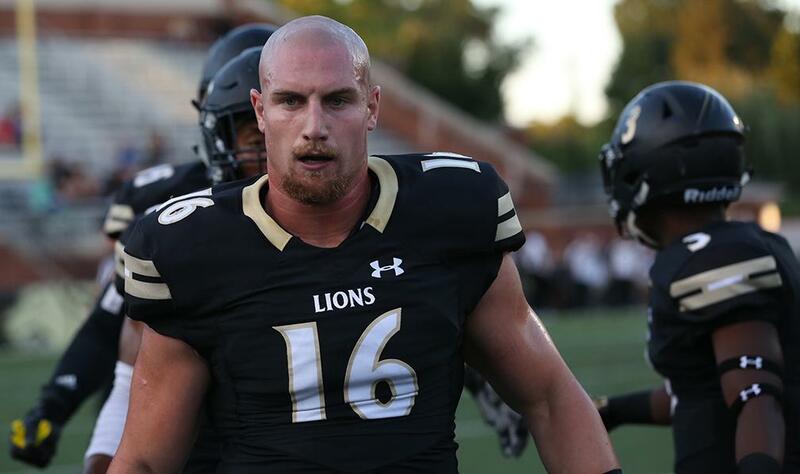 After a pair of Lindenwood incompletions, the Lions added onto their lead by tacking on a successful 34-yard field goal by Lions kicker Travis Spraul, According to Lindenwoodlions.com, the junior from Festus, Missouri, went 3-3 on the night. After beginning the third quarter with a fumbled return, the Ichabods’ return team redeemed itself with a 51-yard kickoff return by return man and cornerback Corey Ballentine. Washburn scored its first touchdown on its first offensive drive of the second half on an 11-yard touchdown pass from quarterback Blake Peterson. The Ichabods followed the touchdown with a successful two-point conversion, cutting the deficit to 16-8. The Lions’ following drive ended up with a punt after a couple of short runs from quarterback Najee Jackson. According to Lindenwoodlions.com, the Ichabods tied the game with a one-yard touchdown rush from running back Mickeel Stewart and made a two-point conversion on a catch from Washburn receiver Corey Woods. The Ichabods then took the 19-16 lead on a 21-yard field goal lead after another punt by Lindenwood on the previous possession. The Lions looked to take the lead back late in the fourth quarter but turned the ball over after a fumble by Lindenwood receiver Deantrell Prince in the end zone for a Washburn touchback. The Ichabods then extended the lead to double digits on the following possessions after a 48-yard touchdown run with 56 seconds left in the game. The Lions, currently 1-2, will try to get back to .500 on the road next week with a game at 7 p.m. Sept. 23 at Pittsburg State.